Have I lost my mind? Probably. Ever since China Glaze released this color in the Island Escape collection last summer I have not been able to stop thinking about it. I've seen swatches of this color, and I like it. I do not know why because yellow-greens are not really the best colors for me. There are many times I went into Ulta picked up this color, and tried to convince myself that we wouldn't mix. I always was able to put it down, and move on. Then I saw it in the clearance section a few weeks ago, and I figured why the hell not? Electric Pineapple is a bright yellow-green creme. I love this! I don't think it's the best color on me, but it so funky and different I cannot keep my eyes off of it. It's funny how when it comes to nail polish I usually stick with colors I've always loved, but when I venture out to something different they end up being some of my favorite colors (i.e. BL Wallis). I'm so glad I ended up getting this. I think my gut instinct about it was correct. I knew I'd like it. What are some colors out of your comfort zone that you ended up loving? I think it looks amazing on you! I remember when I first tried this color I had a weird reaction to it. It was literally love/hate lol. Since I've worn it a ton of times and everytime I get comments on it (good and bad lol). I feel the same way about this one!! It's on my list I just don't know why I never picked it up! Oh I love it on you! I don't own a yellow yet and I've debating for ages now. I may just have buy this one if I find it. Love it! 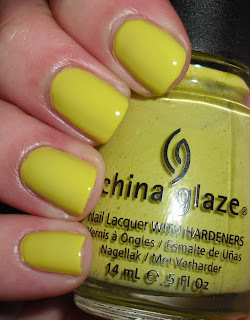 I bought China Glaze Trendsetter to venture out of my comfort zone but haven't tried it yet. Hopefully I'll love it! This is not my type of color, but it looks great on you!! I haven't moved out of my comfort zone yet, so I can't answer your question, lol. Clearance is a wily minx! I do really like this one, but I am super partial to ugly snot colors. Well, I'm sure you know I absolutely love this color. There's not really a lot of things I won't wear, except I absolutely hate tomato reds on me. You know, the ones that are orangey? They look horrid on my skintone. Other than that, I'm venturing into brighter reds and I try to wear pinks although I'm only fond of the searing hot electric ones. This color is really awesome. I own it and love it. It's beauty is understated. I feel like it's very unique without being in your face...a surprising form of neutral color. Oh I loooove this color! Really unique. Pretty shade for what it is. I swear I consider it everytime I do nail art. I love using this color! I love this color too. And I'd have to go with yellows as being out of my comfort zone. It has always been one of my least favorite colors but I am really drawn to it when it comes to polish for some reason. The same goes for orange too. And yay for clearance! I once bought a polish that looked like a plain black with some silver glitter in it and it ended up being a black linear holo! This is such a fun color! Looks good on you. Love to be able to wear any yellow or a green/yellow like this one - but oh my! Yellow is just a dreadful shade on my fingers or toes. I don't get it as I wear it in garments and have always been told I look great in yellow - just not for nails I guess - or for that matter, yellow eye shadow is really bad on me too. For me I find myself occasionally picking out pinks and reds, colors that I normally steer clear of.